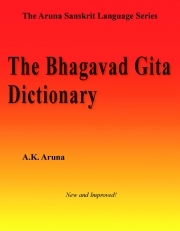 Description of "The Bhagavad Gita Dictionary"
The third title in The Aruna Sanskrit Language Series is The Bhagavad Gita Dictionary. This is a Sanskrit to Sanskrit and English dictionary of the entire Bhagavad Gita. Many entries include reference citations to grammatical rules for their peculiar formations presented in The Aruna Sanskrit Grammar Reference. The derivation of many words is included as appropriate. The entries also provide Sanskrit synonyms and/or meanings, plus contextual Sanskrit analysis of compound words, so that your vocabulary builds beyond the Gita with each use. The goal of this vocabulary building is to encourage you to start to think in Sanskrit while you read Sanskrit—a multiplying effect that greatly enhances learning and builds the skills necessary to progress to Panini and the full grasp of the Sanskrit language, if you so choose. The Aruna Sanskrit Grammar Reference - PDF Version. It costs less and can be downloaded immediately. Being a searchable PDF it also can be an excellent companion to the print version for those who wish to quickly and easily search for any expression or word one wishes. Reviews of "The Bhagavad Gita Dictionary"